Do you really need to be taught how to write a To Do List? Most people are confident that they can keep track of everything in their head. And anytime that list grows to more than a few things, then they’ll casually jot down a list on a piece of scrap of paper. Mastering a To Do List, however, requires a much larger commitment but the benefits in improved productivity can be massive. If you doubt that this much is possible, it’s probably because you need to rethink what’s involved in managing a To Do List. Managing a To Do List requires a consistent commitment of time to the list. It might seem unproductive to spend time every day with the list, but it will soon become obvious that this preparation time is actually key to improving your productivity. Spend the last 15 minutes of every day updating your To Do List as preparation for the next day. I like to keep the To Do List on a single one-sided piece of paper (even if the font gets very small) because by containing everything to one page makes me feel in more control of my life. · Some natural organization or categorization that makes sense to you. Well we’ve just completed what most people already know about a To Do List. Now we move into advanced To Do List management. Figuring out the priority level of any given task is not as easy as most people think. Using the matrix below, most of us have no problem determining that we should prioritize the actions are both important and urgent first, or that those that are both unimportant and aren’t urgent should be done last. Where many make a mistake is doing the urgent actions that won’t make a difference in the big picture of things. For example, when the phone rings and it’s a sales person calling should you hang up? It’s urgent because he is on the phone and I’m sure it’s important to the sales rep, but will this get you promoted? Why would you spend time here when you have a list of important things to do? Most people take the call when they should be working on the big stuff even though the big stuff isn’t due for weeks. Estimate the time it will take to complete each action. 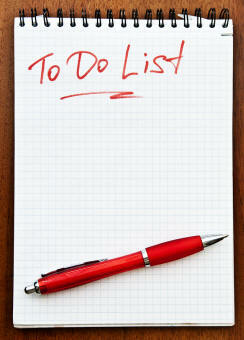 This is probably the single most important step toward truly managing a To Do List. There are two ways to approach this: how long will it take to get this task done or how much time is this task worth to the company? Time is money to any company and every employee should be hyper-aware that by spending time they are spending money. How much is this task really worth? Taking this step before you begin a task will force you to think about its value and in all likelihood it will force you to create a time budget for yourself and you will naturally adjust your efforts to meet that budget. Don’t worry if you do a bad job of estimating. This is a skill that gets built over time and the process of trying to forecast is almost as good as perfectly forecasting the effort. The To Do List is just a list of what needs to get done. But every day you should pull out those tasks from your To Do List that you will complete the following day. Be realistic about how much available time you have and how long each task will take, but create a goal and get committed to achieving that goal. I try to look out a full week at a time. Here are the five things I’ll get done tomorrow and then four more things the next day and so on. If I don’t complete something tomorrow it must go to the top of the list for the next day. And so on. In essence, this means that I carry two pieces of paper around with me. The To Do List becomes the master list while the planning sheet is focused on what’s getting scratched off the list this week. Most of us are both dependent on others or have people dependent on us for the tasks on our list. It’s important that all of us communicate about when we’ll get something done. One of the single biggest productivity killers is if someone is expecting something only to later learn that it hasn’t even been started yet. Communication in this day and age is easy and yet surprisingly few people within any organization are actually very good at keeping people up to date on the tasks they are accountable for. What’s more, this same activity makes each of us a little more accountable and magically that helps get the task done on time as well. People that are on top of their To Do List tend to be more organized, work on the most important things first and even take less time to accomplish a goal because they’ve set a time budget and then try to manage to that budget. Managing a To Do List is a skill that gets developed over time but the gains are immediate even if you only succeed at trying to accomplish all six steps.